Hey, Bren!!! I NEED HELP! I'm an unscouted member of the Audio portal, but I am not allowed to be scouted, even the ban I got had expired, because of Step. He shall be DE-MODDED (Not.). Only the users themselves can tell you why they blocked you. Then again, since they blocked you, you have no means of asking them. But from your previous post it's not hard to guess the reasons. Protip: Don't harass mods because of a ban. Maybe because of the signature I have written, because it is just a dare, so on, I will change the signature TO STOP harrasing the NG users. OK buddy, I'll give you this one shot, but I will NOT accept any responsibility for the outcome, whatever that may be. I'm just the messenger. @Waterflame @Step @ForeverBound - Would any of you care to enlighten this poor soul? You've been sending me invitations to join your audio projects non-stop. I think I got something like ten to fifteen invitations from you. The only reason I blocked you is so that I'd stop receiving them, because they were all projects I wasn't a part of. I'd be willing to bet that's also why Waterflame and ForeverBound blocked you. If you want feedback on a submission of yours now and again, then kindly ask one of us in a PM, and don't send more if we don't reply or can't give you feedback. You can also use this thread to exchange reviews with other members of the community, which is really one of the best ways to get reviews. And as a rule of thumb, don't invite people who weren't involved at all in your projects. Regarding the scouting, I scouted you - you should have received a private message in your inbox asking you if you'd like to accept. Thanks step for clearing this out. Only reason why I blocked you is cause there where so many invites and I'm not even part of the project or you didn't use any of my music etc. So there is no need for me to join them then. I just spent quite some time trying to find what the file size limit is for submitting without any results, so here's a suggestion. - What is the file size limit for submitting? - current limit is ...M for swf, ...M for audio, ...M for art, etc. I heard if you make a lot of alt accounts it will get you banned. So, how many alt accounts can you make? It would be nice (unless I'm missing something) to have a link to the list of moderators from this page so people will know who to PM. The Review Request club, the Blammers List (update every 15th), and the Protectors List (Update every 1st). My sig has it all. We had one but it kept getting out of date. I think @liljim was going to generate an automated list at some point but I don't know where we are with that. 1. People would contact moderators who may or may not be able to respond in a timely fashion. We can't expect them to be around 24/7. 2. They would contact EVERY moderator on a given list with the same issue (often due to #1), which is a big waste of everyone's time. I've been consolidating some of the mod tools and there's going to be live lists in each of those sections, so everyone on those teams should know who each other are. At 5/3/15 11:46 AM, ArcadeDominator wrote: I heard if you make a lot of alt accounts it will get you banned. A few is ok as long as it is not causing issues, if you start to creative massive amounts of accounts, you can expect them to get deleted. At 5/23/15 08:25 PM, SmileyShoes2 wrote: Here a question: What is the best thing you can use to make audio for newgrounds? At 5/24/15 09:29 PM, ZeroDown wrote: In theory, is there a max amount of times you can be banned? Like, to the point where they just delete your account? I believe it depends on the offense. No, there isn't a number where your account is automatically locked or deleted. You won't be surprised by your account poofing away just because you hit 10 forum bans. In the rare cases where an account is locked or deleted there is very little surprise to anyone that it is going to happen. At 6/7/15 12:33 AM, ZeroDown wrote: How do you do that thing that some users do where they're posting and they have a part in their post that's kinda greyed out and pushed to the side? Also make sure you don't forget the space between : and the text, or else you'll look like an idiot. don't forget the space between : and the text, or else you'll look like an idiot. More than one space is too much and less than one space is too little. I'm having a little trouble with my playlists. First of all, I can't figure out how to add songs to a playlist. To make matters worse, I don't know how to create new playlists! I REALLY want some answers! At 6/22/15 06:39 PM, EthanWallee70 wrote: I'm having a little trouble with my playlists. First of all, I can't figure out how to add songs to a playlist. To make matters worse, I don't know how to create new playlists! I REALLY want some answers! Above each song there's an 'add to playlist' button. 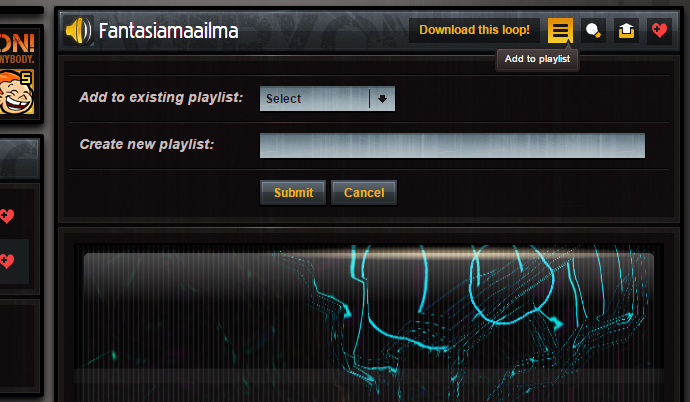 Go to the song you want to put in a playlist and click said button. You can also make a new playlist there. I just saw that before I saw your post! Now I feel pretty silly. At 7/16/15 10:33 PM, ZeroDown wrote: Is there any way to enter a private session and hide my online status? Yep, just click this button in the header. The real answer is "no." I have a problem. I play games, earning achievements. But they are not working! Like, i go to my page and my achievements aren't showing! And when i go to the game where i had an achievement, I didn't earned it (the game says)! Need some help! Is this happening with one game in particular or all games? All games. Its happening with all games. Also, it didnt happened last year. Something is really wrong with it. Guys, i found this problem! Sorry for worrying you. Now I have my medals.